Viewsonic ViewPad 7 - two up for grabs! TechRadar has teamed up with Viewsonic to give two lucky people the opportunity to bag themselves a Viewsonic ViewPad 7. 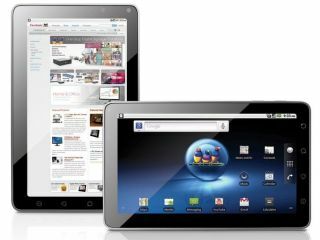 Running Android 2.2, the ViewPad 7 is a seven-inch device that does everything. It's a smartphone, computer, game centre and an ebook reader – all in one device. The Viewsonic ViewPad 7 allows you to download all the latest apps from the Android Market so you can do anything from making video calls through to real-time translation, music streaming and much, much more. And that's not all, if you aren't lucky in our competition, Viewsonic is currently letting users try out the ViewPad 7 for free. If you purchase a Viewsonic ViewPad 7, then you have 30 days from the invoice date to use your product. If you aren't happy with it, you simply complete the online form, print it off and send it in with your ViewPad 7 in its original packing along with proof of purchase. Terms and conditions apply. This competition is now closed. The winners are Mr Jehnsten and R Haslin.